Reliable Signage & Lighting is a leader in the industry and we have earned the respect and confidence of our clients to service their signage needs. We take your image and security lighting seriously. That is why we use the highest quality parts available. 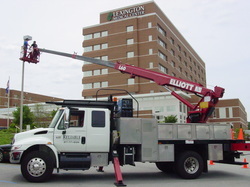 In addition, we use the best tools and equipment so that we can service your needs more efficiently. Don't just take our word for it...read the comments from our clients below! "Reliable Signage & Lighting is the best thing since sliced bread! We would never call anyone else. We've been with Reliable Signage since the day they started the company because they are extremely fast and responsive. They are honest and kind people!" "As a consumer, I have never been so impressed! They do not waste any time getting to the bottom of a problem, and once they do, they are ready to execute! They go to great lengths to be sure all repairs are done in a very professional and seamless manner, and I am blessed to have them as a RELIABLE resource." "Reliable Signage & Lighting provides our company with quick and reliable service for all our signage. They help keep all our lights working at all times. Thank you for all you do for us." "Reliable Signage & Lighting has been doing our sign service and repairs in the Columbia area for several years. We are completely satisfied with their quality of work, promptness and pricing. We also love their drive-by service checking on outages. We highly recommend them to all." We understand the importance of quality, maintain the highest standards, and have developed a reputation of honesty. Our refined and proven service model provides our clients with the industry leading levels of service and support. We also care about your budget. If the necessary work exceeds the agreed upon estimate, then you will be notified prior to the work being completed.